In this little article, I'm intending to give a simple overview of the most common types of strings used on acoustic fretted instruments. There are lots of subtleties, sub categories, special composition, and winding techniques I won't even touch on. Not to mention brand names, qualities, etc. Just a piece of steel wire, you say. Yes, and we call it a "plain steel string." Pretty much, all plain steel strings are about the same in their basic tone. 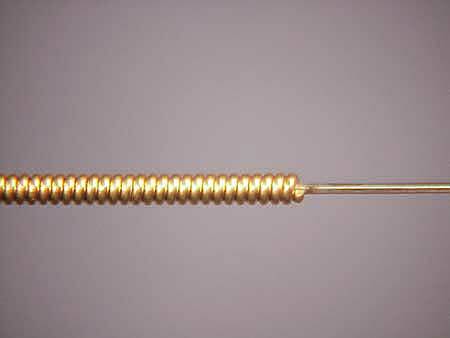 In order to produce low pitched notes, a string may have metal windings over the core, to increase its mass. The heavier the mass, the lower the note the string can produce at a given tension. Sometimes known as "80-20 brass," the brass (sometimes called plain bronze) has a slightly more yellow color. 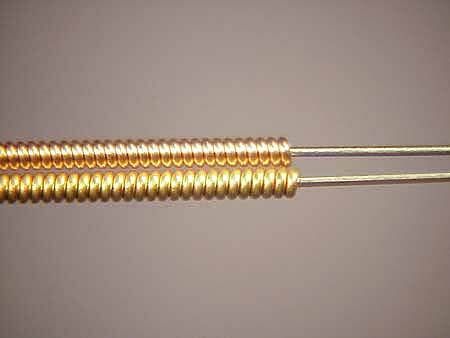 The upper string is phosphor, the lower plain brass. Just as the color difference is subtle, so is the tonal difference between the two. Some players find that one or the other lasts longer before sounding "dead." That's probably due to subtle differences in our skin chemistry, because it's the handling that causes them to deteriorate in sound. Steel strings have a bright, metallic sound, and are used on acoustic guitars, electric guitars, banjos, mandolins, and a host of other instruments where that strident, strong sound is required. No missing this one. It's very different in color, and very different in tone. It sounds less "bright" when new, but lasts MUCH longer before corroding and dropping dead, tonewise. In fact, the windings may be pure nickel, "monel" (a nickel steel alloy) or stainless steel. These strings have windings with magnetic properties, and are primarily used on electric instruments with magnetic pickups. Personally, I like them for my acoustic mandolin because of their mellow tonal qualities and super long playing life. 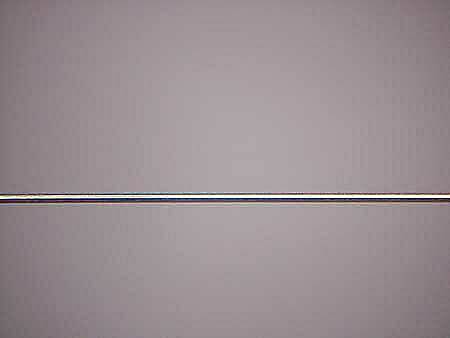 It's known as a "silk and steel string" or "compound string." 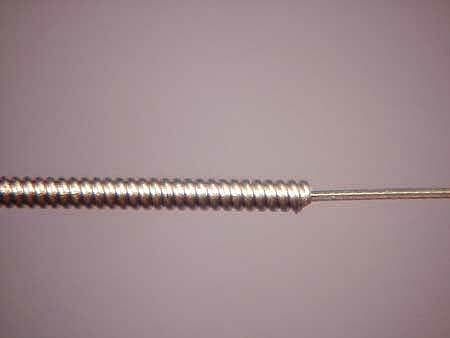 It has greater flexibility than a regular wound steel string, and operates at a lower tension. That makes it ideal for very delicate instruments or for super light left hand fretting action. Of course, there's a tradeoff. 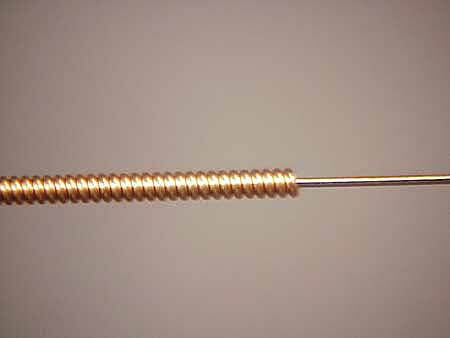 Compound strings are more likely to buzz, and have a much shorter useful playing life than regular wound strings. 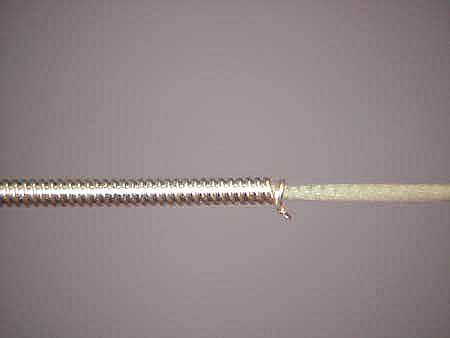 Silver plated windings are hardly ever used on regular steel strings, and I really don't know why they are so commonly found on compound ones. It may be a holdover from the classical guitar strings, which are often wound with silver. 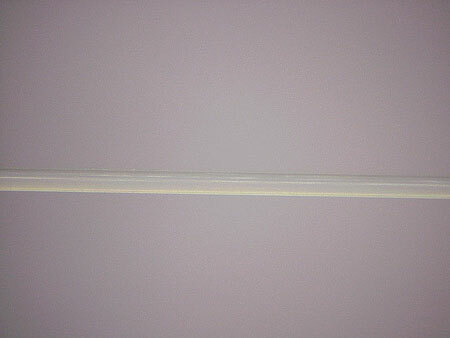 Silver plated windings on top of a core made of straight, fine nylon filaments. 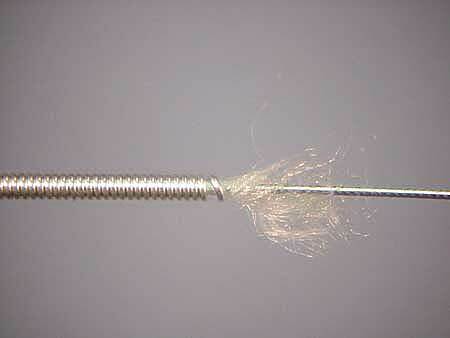 Monofilament strings come in different colors, although most are clear like this one. Both plain and wound nylon strings have a soft, mellow tone compared to steel plain and wound strings. They are the choice for classical guitars and ukuleles. 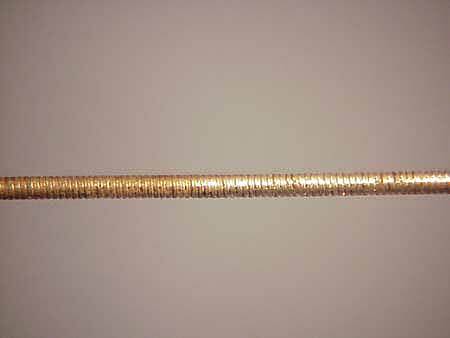 It's an old classical guitar string, with silver plated windings.